“Une Nouvelle Vie” by Christina Sng, which appeared in LONTAR issue #7, is eligible for a 2017 Rhysling Award in the Short Poem category. To support one of our most regular contributors, we are posting the poem in its entirety for Rhysling voters. Enjoy. Father tries to comfort me. We will find your mother. “Une Nouvelle Vie” is copyright © 2016 by Christina Sng. The 2016 edition of the Singapore Writers Festival wrapped up last night, and it was once again a successful and energising event. If one complaint could be had, it was that there was so much to do and see that you simply couldn’t attend every panel or reading or activity you wanted to unless you split yourself four ways (which we wouldn’t recommend). A fascinating discussion between four editors of four different literary magazines, told to a packed audience. Cyril very ably moderated the wide-ranging discussion, about the motivations for us starting our journals, the advantages and disadvantages of publishing online vs in print, the types of pieces we are most likely to accept, and self-publishing vs having a publisher. Shu Hoong is the essays editor at QLRS rather than its founder, but he still offered insight into what makes such a respected journal tick. Clara’s story about the generation of the name for We Are a Website was hilarious. And Cyril’s comment that he established SOFTBLOW as a way to feel less alone was beautifully poignant. All four of us did an excellent job emphasising the importance of literary journals (especially in these days of waning empathy), and hopefully generated interest in submitting to all four of them. The three panelists, all published in Issue #6 (among others), did a fantastic job talking about how Southeast Asian speculative fiction in English has become an increasingly important force in publishing, both locally and internationally. Eka’s story about being published first by friends and then larger publishers in Indonesia, and then translated into English and distributed worldwide (which he expanded on in his meet-the-author session the following day) was a unique look into his writing journey. Yi-Sheng presented a brief powerpoint presentation on more notable SEA SF works, and made the observation that some of the most well-known SEA writers are not actually writing about SEA in their novels (eg. Zen Cho’s Sorcerer to the Crown). JY brought up the problematic postcolonial nature of writing in the language of a nation’s former occupier, and the fact that she’s much more known in speculative fiction circles outside of Singapore. I’d originally planned to have all three panelists read from their work, but the discussion itself was so fascinating that we continued in that manner instead. However, you can read their fiction in the pages of LONTAR and many other places just a google search away. Observations were made by audience members both during the panel and afterward that it would have been good to have a Filipino writer also on the panel, since speculative fiction is such a vibrant genre in the Philippines, and I couldn’t agree more. This standing-room only event was the big one for us; it turned out to be so popular that even Festival Director Yeow Kai Chai wasn’t able to get a seat! This was incredibly gratifying after fears that only a handful of people would show up, and I’m very thankful to everyone who packed that room to beyond capacity. I made sure to mention our Patreon at the end of the hour, and I hope that we intrigued folks enough to both give our journal a chance and pique interest in other regional writers doing such incredible work. Literary journals have become invaluable platforms for discovering new literary talent as well as showcasing new works from established authors. 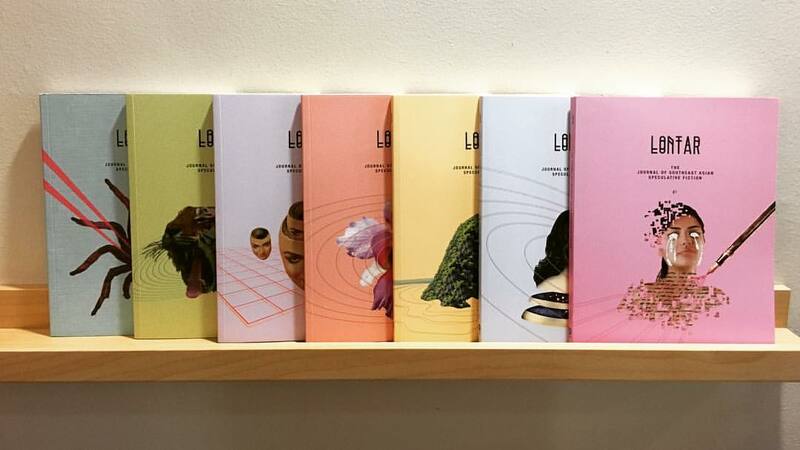 Three editors, Yong Shu Hoong (QLRS), Clara Chow (We Are A Website) and Jason Erik Lundberg (LONTAR) discuss the importance of literary journals. Southeast Asia is a culturally rich source of inspiration, with histories rooted in the rise and fall of civilisations and colonialism. Eka Kurniawan is the latest literary star in the region, leading the charge with his ground-breaking speculative fiction novel, Man Tiger. This panel examines the global and regional impact of speculative fiction. * Krishna Udayasankar (L6) was originally slated to be on this panel, but is unable to appear at SWF this year. The second panel in particular is basically an unofficial LONTAR panel, since it will be moderated by me, and the three panelists have all been published in our pages (Eka in L6, JY in L3 & L6, and Yi-Sheng in L4–L6). Issue #6 will definitely be available in the festival bookstore run by The Select Centre, as will the brand new issue #7 and all our back issues as well, so be sure to nab your copies and get them signed by our fantastic authors! L7 is Out Now in All Formats! The print version of issue #7 should be appearing in bookstores in Singapore this week (if it hasn’t already); the ebook version was released to our Patreon patrons yesterday, and I woke up to the news this morning that it was already up at Weightless Books along with an interview with L7 contributor Zen Cho! So! Look over the contents for L7 on our website, and read Zen Cho’s story “七星鼓 (Seven Star Drum)” and the interview with her for free. If you’re in Singapore, stalk your favourite bookshops for the issue (if it’s not there, please ask them to order it!) or order it directly from Epigram Books. If you dig ebooks, nab it now from Weightless Books. Once you’ve read it, please rate and review it over at Goodreads. And do consider becoming our patron, to ensure that we continue to bring you such dynamite issues! The contents for issue #8 have now been finalised and the authors contacted, so if you’re waiting to hear from us, it means that your piece is still under consideration. We appreciate your continued patience. Issue #7 arrived from the printers yesterday, and will be making its way to Singaporean bookshops within the next couple of weeks. However, you can order it right now directly from Epigram Books! Next week, I will be distributing the ebook to our Patreon patrons, as well as getting ready to mail the print edition to our Galaxy Level funders. So, if you want to get your name in the ebook edition of L7 (and for both versions in forthcoming issues), pledge before 12noon Singapore time on Saturday the 15th to begin your patronage with this issue! We have an additional surprise today! Zen Cho’s wonderful tale “七星鼓 (Seven Star Drum)” appears as the lead-off story in our upcoming seventh issue, and we’re happy to present it here in its entirety, completely for free. Enjoy! Boris had been born with an extra membrane around his brain that filtered in things other people didn’t see. This was not unheard of. Everybody knows somebody who can see ghosts. But Boris’s peculiar tragedy was that his parents were sceptics. Marvellously, incredibly, they did not believe in spirits. It was not just that they did not pray. Boris’s parents used to go jungle-trekking during their holidays. They were the kind of people who kicked tree stumps and shouted at the wind without fear of retaliation. They spoke openly of death as something that happened to everyone—something that would, one day, happen to them and people they knew. This is all right, unless you are a child who sees ghosts. And Boris saw all kinds of ghosts. His eyes did not discriminate. He saw red-eyed, white-faced, long-tongued vampires, hopping horribly, reaching out for him with sharp-nailed hands. He saw pontianak and langsuir and toyol and penanggalan, orang minyak, hantu tetek, hantu kum-kum, evil genies, plain old dead people. Even the quiet ones were terrifying, with their sad eyes and transparent bodies. They were so hungry. Every ghost wanted something from Boris. Usually they wanted his entrails. As a small child Boris started at everything. He was afraid of shadows and the dark, of loud noises, of whispers, of people with red faces, of cats and dogs, of old people and babies. He could not sleep if it was raining. He threw tantrums if he was forced to go to the bathroom alone. This was irritating for his parents. Boris withdrew into himself. People started wondering if there was something—you know—funny about him. They felt sorry for his parents, though it was Boris who was suffering, at prey to the whims of the ubiquitous underworld. In the picture on the lion dance troupe’s website, Boris looks strong and cheerful. His forehead is beaded with sweat from a training session; his lean arms hoist the lion head high in the air. He smiles fearlessly into the camera. You can tell that here is a young man who has found a destiny to push him forward. He has the sunny conviction of one secure in the knowledge of what he is meant for. But peel off the layers of time, roll him back to the child he was. Boris never got very large or tall, and he’s never quite lost the frown that drew his eyebrows together. With not too strenuous an effort of the imagination you can see in the dauntless lion dancer the child’s skinny legs pitted with scabs, the hunched shoulders, the small, guarded face. He could easily have lived out his life with those hunched shoulders, pursued by the unfulfillable longings of the dead and spiritous, if not for the discovery. It had happened when he was seven. It was Chinese New Year and for once his parents hadn’t gone hiking on some spirit-soaked mountain. They were in Ipoh, where Boris’s grandmother lived. His parents were buying kuih from a street-side hawker stall when Boris realised there was a man at the end of the street whom he should not look at. Boris had learnt not to seem frightened no matter how much his heart shook and his breath stuttered. But his eyes stopped seeing; his mouth went dry. Because he refused to turn around he was not sure what the man looked like, but out of the corner of his eyes he saw the inhuman blue tufts of hair. He smelt the stale exhalations of the undead. He must be calm. The man had not yet realised that Boris could see him. Seeing ghosts was not really the problem. The problem was when they looked back. Boris could not help himself. He looked. He was wrong after all. It was only shaped like a man. When you had a proper look at it, it was not very like. Nobody told Boris what happened when ghosts realise you can see them, but he knew it on a bone-deep level. He had escaped horror many times in his short life, but somehow he knew this time was different. The thing started moving towards him, in a spiky mechanical shamble. Boris could not move or cry out, though doing that had saved him before. He was frozen. He knew his doom was upon him, that fate was about to touch him on the face. That was when he heard the drum. The thing paused and raised its many-eyed head. The lion came flaming down the road, attended by golden clashings. “Ah,” said the hawker stall auntie, pleased. “Aiyoh,” said Boris’s parents, dismayed—just when they’d thought they’d be able for once to have an afternoon out without an exhibition from Boris. They looked at Boris and seeing his still face, thought him struck with terror. It was a great emotion that held Boris in its grasp, but for once it was not fear. The lion was gold and red and silver; its head was white-furred like the face of a kind grandfather; the bounce of its feet was like the dance of sunlight on water. Its sequined body twinkled in the lights from the hawker stalls. The sky was blue with evening, but the lion was bright as the day. When it landed in front of him his mother put a hand on Boris’s shoulder, to reassure her always-frightened son. But Boris looked up into the lion’s round glass eyes and what he felt was love. The lion’s hinged mouth dropped open. The antennae on its snout quivered. Its hot stinking breath brushed his cheek. Boris knew, for the first time in his life, that he was safe. For once the membrane showed him something worth seeing—the fact that the lion was real. He saw the muscles rippling underneath its fur-lined scaly hide. He saw the pulse throbbed out by the drum shake the lion’s flanks. Under the clanging of the cymbals, he heard the ghost chitter with fear. When the lion reared on its back legs and leaped forward, when its massive jaws closed around the ghost, it was only doing what Boris had expected it to do. The other people on the street saw the lion eat air. Boris saw the lion’s first snap crush the ghost’s leg. The lion bowed its head, blinking at a gourd quietly placed on the ground by a troupe member. A second snap. One way of seeing: a human hand reached out from the lion’s mouth and grabbed the gourd. You could only see it if you were close to the lion, and only from a certain angle. It was so swift you could almost believe the lion had done it itself. But lions don’t talk—or roar, for that matter. They let their hearts speak for them. As the lion pranced away down the road, the drum and the cymbals following, Boris disengaged his hand from his mother’s and walked to the spot where the ghost had been slaughtered. The lion hadn’t cleaned its plate. A great brown slug glared up at Boris from the ground. Bizarrely for a slug, it had six staring red eyes, and a lot of blue hair. Boris squashed the slug under his heel. The viscera of the slug was corrosive. Smeared on the road, it created the smallest of potholes. Boris inspected the underside of his shoe. There didn’t seem to be much shoe left, so he decided to take it off. His mother could never understand what had happened to that shoe, and she never knew what happened to her son, either. He became outgoing and unflappable. He stared fearlessly into the corners of houses, went to sleep the minute his head hit the pillow, seemed to enjoy horror movies as if they were comedies. At ten, he started to train with a local lion dance troupe. He went on with it when he went overseas to study, and founded a troupe at university. “Otherwise I’ll have nothing on my CV,” he said when people asked, but really it was his favourite thing to do. It was an expensive hobby, however—lion heads cost a few hundred pounds; the large drum costs more; and all these things must be replaced as they are worn down over time. The university paid out a little to support cultural diversity, but it wasn’t enough. People are happy to shell out to have a lion dance inaugurate their shop or bless their wedding. They pay even more to have the skeletons cleaned out of their closets. Nobody likes having a ghost in the house. “What happened to Boris?” said Jia Qi. “But that’s why you got into it, isn’t it?” said Coco. “Yes, but,” said Boris. His eyes went filmy and distant—though maybe that was just the redness of sleep deprivation. “That’s one story,” said Boris. “But the other story is, maybe the lion is the Nian. You look at the lion. It doesn’t look much like real lion, right? Where got real lion got horn? Maybe the Nian has horn. In the end maybe it’s the same thing. “You ask me if I love my mother as much as that lion, I don’t know if I would say yes or not,” was all Boris would say. But to be fair to Boris, he was pretty drunk at the time. “七星鼓 (Seven Star Drum)” is copyright © 2016 by Zen Cho, and is a companion piece to “起狮，行礼 (Rising Lion—The Lion Bows)”, which was published at Strange Horizons in March 2011. Cover and Contents for LONTAR #7! 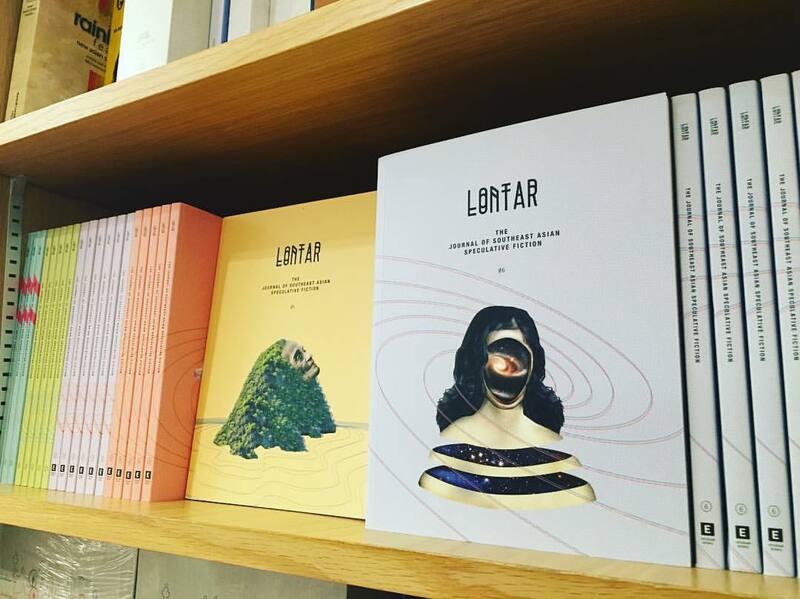 We’re only a month away from the release of LONTAR issue #7! And I’m proud to reveal both the cover and contents for the new issue, which presents speculative writing from and about Malaysia, Vietnam, Singapore, Laos, the Philippines, Indonesia and Korea. The issue will be available in mid-October in bookstores all over Singapore, on the Epigram Books website, and as an ebook through Weightless Books. Patreon has just processed patron payments for June, which means that everyone who pledged by the 27th has received both the epub and mobi files for the LONTAR issue #6 ebook, meaning that you can read it on virtually any e-reader in the world. Yay technology! If you pledge anytime between 28th June and mid-October, you’ll be able to receive our seventh issue, which is another doozy. I’ll be releasing the table of contents and cover art soon, so be sure to pledge ASAP so that you can enjoy our patron-only content. To become a LONTAR patron starting with issue #6, you must pledge by midnight EST on 27 June. More on this below. On 28 June, I will put up a Paid Post that will give all current patrons immediate access to the ebook version of L6, in addition to any other rewards they get based on the tier at which they’ve pledged. Therefore, if you want to become a LONTAR patron starting with issue #6, you will need to pledge by midnight EST on 27 June. This is because Patreon does not charge you if you pledge after a Paid Post has already been made (and therefore, you will not have access to that post), so if you pledge after midnight EST on 27 June, then your patronage will start with issue #7 in October. Much of my confusion came with how and when patrons were charged (I’d thought that it was automatically at the end of the month after they pledged, but nope), as well as how patrons could access the ebook version of the journal. Patreon has very firm rules on both of these matters, but only for creators who charge based on content released; for creators with monthly patronage, things are much easier. This is all a learning experience, and so I hope you’ll forgive the little hiccups like these that may arise. I want to be fair to our patrons, and also make sure that we get paid for what is being pledged. So one more time: if you want to become a LONTAR patron starting with issue #6, you will need to pledge by midnight EST on 27 June. For the first time, LONTAR is increasing its payment rate for contributors! Yay! Payment is now a flat $30 SGD per short story or non-fiction article, $15 SGD per poem or set of poems, $55 SGD per original comic and $30 SGD per reprint comic. These new payment rates will start with issue #7, which is scheduled for October 2016, and it’s another cracker of an issue. And if you want to help bump those rates up even further, become a LONTAR patron today!